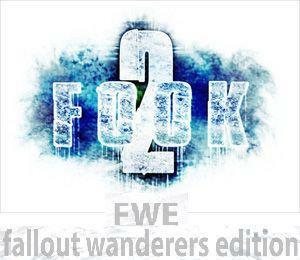 Mergers various conflicts between Fallout Overhaul Kit & Fallout Wanderers Edition - a new version for FOOK2 1.0 & FWE 4.1.1 above & beyond. 09-12-10: Woah FALLOUT 3 looks good with all these new mods floating around - making me want to return here and mod again :) - stay tuned! FWE-FOOK merger -old version- -outdated. wont work with current version of FWE, hence this mod. add 6 points to vanilla Auto Rifles). want to leave it alone, including the fook+fwe+pb+mmm patch. Project Beauty & MMM - Project Beauty HD, CALIBR, FOOK2, FWE, MMM, Anchorage, The Pitt, Broken Steel, and Point Lookout. EVE & UWWUT - CALIBR, FOOK2, FWE, Anchorage, The Pitt, Broken Steel, Zeta, UWWUT, and EVE. Fully intergrated all patches of Project Beauty HD into the fook+fwe+mmm+pb.esp here....all you need is the meshes and textures and PB HD.esm from their page. -fix a few errors with fwe 4.1.1 - might have overlooked a few which is minor anyway. -Gave Talon mercs FOIP's "MMM-FWE master release" names which previous version overrode. -updated the eve+uwwut patch also fixed the eugene unique textures - should show now havent tested anything in game yet. Basic load order is from my experience and using b.o.s.s. as a reference, should download and take a look at it. - fixed alot of bugs and misc things not worth mentioning as you probably hardldy noticed them. -fixed the tri beam laser rifle in the fook+eve+uwwut plugin before it was shooting marker errors and i increased the spread and corrected model file paths - an error on Offkorn's part. - cant remember what else i fixed and/or added. -added a detailed overhaul load order readme to the file section. OFFKORN of course you can and should still use his page as a reference for load order and links and read old comments till i get this page up and running. He has stop modding for FO3 and gave me permission to take over his work which is no easy task ;(....let me know if anyone has any problems.